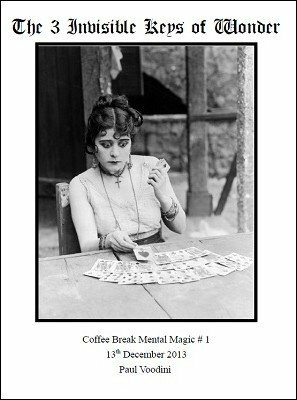 3 Invisible Keys of Wonder is the first edition of Coffee Break Mental Magic, a weekly Paul Voodini PDF publication featuring stunning routines that utilize commonplace tools of mentalism, and sold for less than the price of a cup of coffee. The emphasis on the routines is powerful storylines and simple mechanics, meaning that all can enjoy them and use them, from beginners to seasoned professionals. Normally the weekly Coffee Break Mental Magic release will feature a single routine, but to celebrate its launch, this first edition '3 Invisible Keys to Wonder' features three original routines, all sharing powerful back-stories and intelligent routining. To perform these routines you will need to provide some equipment of your own, but the equipment used is the kind of equipment that most (if not all) magicians and mentalists will already have in their toolbox - for example, a packet of cards or perhaps an invisible deck (it rarely gets more complicated than that). Coffee Break Mental Magic will always be charged at just $3 meaning it is accessible to all, and with this first edition featuring three routines, that's just $1 per routine! The Gemstone Mind-Reader - a precious gemstone is able to correctly read the mind of a spectator! My Childhood Memory - a volunteer sees into the performer's childhood memories and correctly predicts something that only the performer should be able to know! The Good Fairy Byzantium - a particularly dark fairy tale comes to life in the hands of the performer. Maybe some magic is real after all! All routines are fully scripted and explained. 1st edition 2013, 15 pages. I have several e-books by Voodini, and have never been disappointed. His 'self-working' routines are particularly good. Not for the methods. Methods are almost afterthoughts. Voodini's strength is in creating an atmosphere, drawing people in with a good story. That's what you get here: three good stories. The Coffee Break concept is a good one, and this is a brilliant way to begin the series.